This year we had to quickly change gears as we just celebrated Hallowe’en last week. Now we find ourselves preparing to observe Remembrance Day. 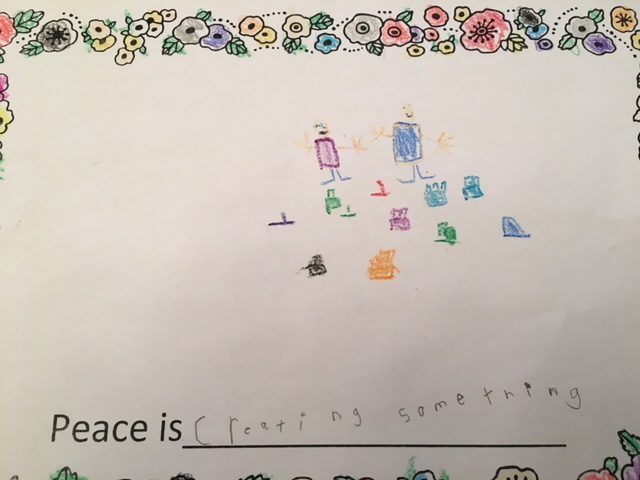 We talked a lot about what Peace means to each of us on a personal level. 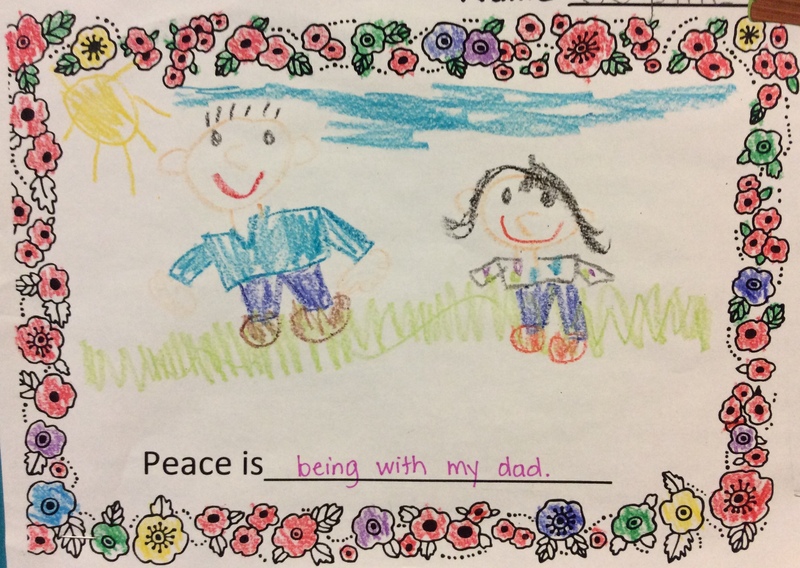 Todd Parr’s excellent book, The Peace Book, helps us to understand peace is all around us. Our family and friends, our environment, and acceptance and appreciation of others can help us find peace within ourselves. The children were quite reflective, and very thoughtful, as they expressed their ideas. 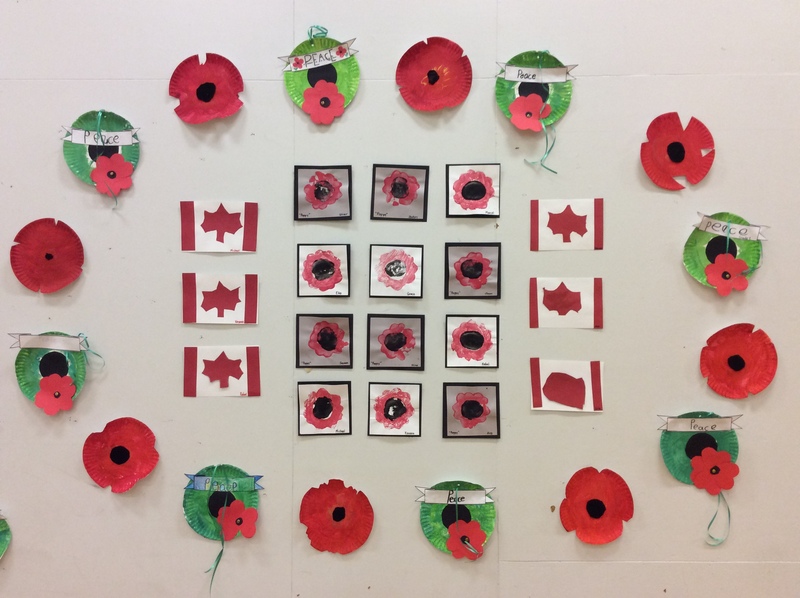 We focused on several symbols this year as part of our Remembrance Day learning. 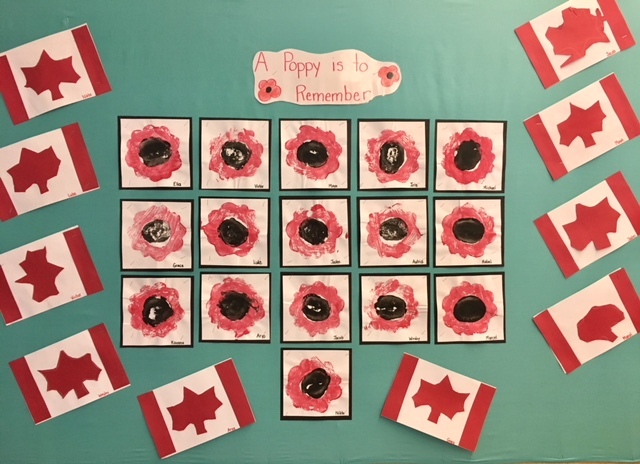 We read a Poppy is to Remember and made poppies using an acorn squash and a potato. One of our art techniques this term was learning about printmaking. The children were fascinated to watch us cut open the squash, remove the insides, then paint it to make the prints. 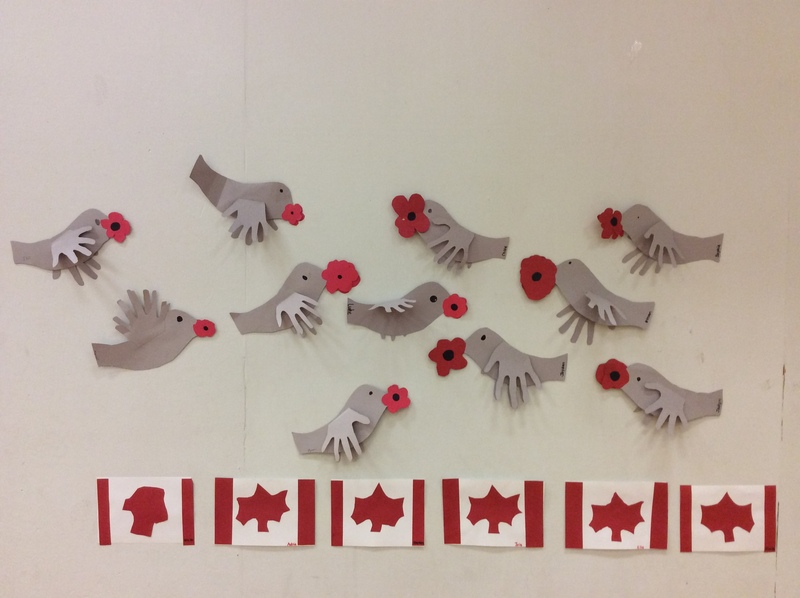 We made our small Canadian flags in honour of Canada’s role as a peace keeping nation and read the story Why I Love Canada by Daniel Howarth. We made peace doves with our Grade 7 Buddies. We always feel peaceful with our beloved Buddies. 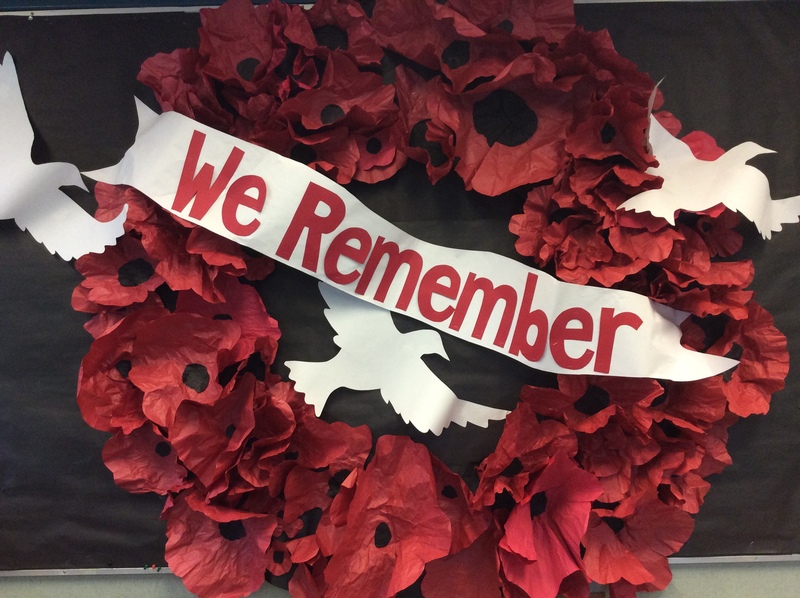 We contributed some of our crafts to the displays of student artwork for the Remembrance Day Assembly. The Remembrance Day Assembly is a formal, serious Assembly. We are expected to be silent from the time we leave our classrooms, walk down the hall and make our way to the gym. We were very pleased with how our children visibly demonstrated excellent self-regulation throughout the ceremony. Teachers of the upper grades always observe how calmly the Kindergarten is able to sit, and for a long duration (about 35 minutes). Sometimes people think small children cannot sit still, without talking or demonstrating unexpected behaviour, in serious situations. We know otherwise. We know our children can, and do, learn strategies for self-regulation and are able to use them appropriately according to their social situation. We knew from the program there would be a long segment where the children would need to really self-regulate their bodies. The first was the playing of “The Last Post” and “Reveille,” beautifully performed on the trumpet by one of our Music teachers, Mrs. Soderling. We had asked the children not to cover their ears if the music was too loud; rather, they were to close their eyes and breathe deeply. We know from our strategy of listening to peaceful music in class that our children would be more than able to manage their energy. Second, between these two performances is a minute of silence. A minute can be a long time. We noticed the children were doing a lot of quiet deep breathing to help them get through, as we had taught them they might need to do. Before we left for the Assembly we had explained to the children we practise self-regulation strategies every day so that when we need to use them, we’re ready. And we certainly did justice to all of our practise these two months. Remembrance Day 2017…in honour of those who have served, and continue to serve, their countries.